The Eurasian eagle-owl (Bubo bubo) is the largest owl residing in Poland and Europe, with a wingspan of 155-180 cm, body length of about 70 cm and body weight of 4 kg. Its plumage is brown-yellow with numerous black lines and spots, which enables perfect merging with the background and makes the bird difficult to see in its natural habitat. Characteristic features of the Eurasian eagle-owl are the large orange eyes and the so-called "ears" that are tufts of feathers, 7-9 cm long which the bird lifts if threatened or interested. Sexual dimorphism in plumage does not exist but is visible in body weight – females are larger and heavier than the males. This species is most easily detected by the mating voice produced by the male, which is a very distinctive, low, two-syllable "oo-hu" audible from a distance up to 3 kilometres. The warning voice, similarly to the Ural owl, resembles a dog barking. This species is sedentary and monogamous. Pairs stay together throughout their lives. In the mountains it frequently nests on ledges, in the lowlands it uses the nests of other birds (such as buzzards or black storks) or it nests directly on the ground, under fallen trees or between tree roots, which unfortunately results in large losses due to nest damage by wild boar or predatory mammals. The bird voluntarily occupies artificial nesting platforms. The female usually lays 2-3 eggs at intervals of 2-4 days. Nestlings do not hatch at the same time so when food is scarce, the younger and weaker ones die. They reach sexual maturity in 2-3 years. The Eurasian eagle-owl is a strongly territorial species. A pair of birds usually occupies a nesting ground with a radius of 2 to 4 km. The Eurasian eagle-owl inhabits areas of varying structure, providing an abundance of food, peace and availability of potential nest sites. In the lowlands it lives in moist environments: alder forests, riparian forests, and coniferous forests, edges of swamps or old pine forests. However, the presence of meadows, lakes, swamps, river valleys and other open areas where it can hunt is very important. In the mountains the bird prefers to nest in coniferous and deciduous forests, especially in places with rocks and steep slopes. The Eurasian eagle-owl is a food opportunist, a species primarily hunting for the most available food, that which is the most abundant in the environment. Its diet also depends on the season and region. In general the bird the most often feeds on medium-sized birds and mammals. It the most voluntarily hunts for water voles, rats, common voles and squirrels, whereas among birds its prey includes mallards, Eurasian coots, common wood pigeons, rooks, ravens and grey partridges. Moreover, it does not despise carrion. The Eurasian eagle-owl is sparse throughout Europe and Asia. In Poland it occurs very rarely throughout the whole country except for central Poland. The largest populations are found in the Lublin region, the Biebrza valley and the Kłodzko Basin. In Poland the Eurasian eagle-owl is under strict protection. 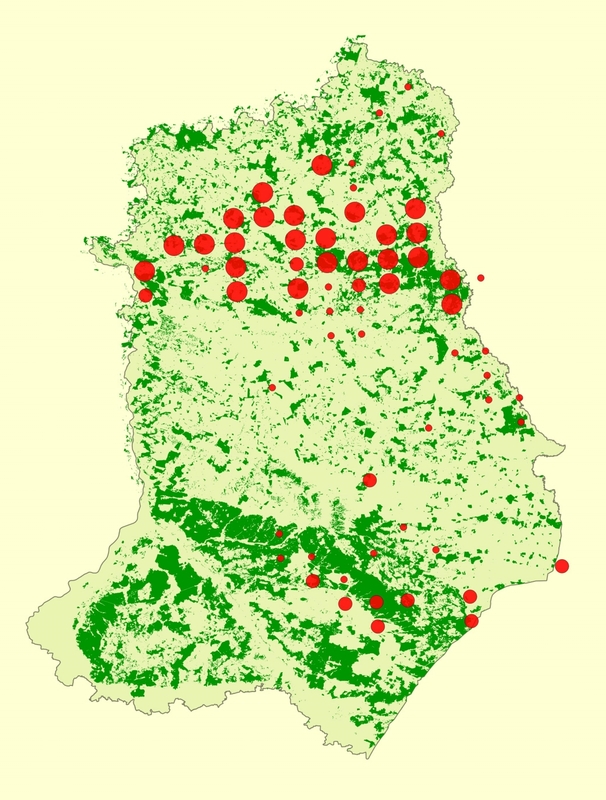 Nest protection zones are designated around Eurasian eagle-owl nests: for the whole year with a radius up to 200 m and periodically (from 1 January to 31 July) with a radius up to 500 m. The bird is listed in the Polish Red Data Book of Animals and in Attachment 1 to the Birds Directive. In Poland its abundance is estimated at 250-280 pairs. cutting down old trees which form convenient nesting places.